The deadline: we love it, we hate it. It's still there, but somehow we've managed to leak in betweens its supposedly rigid borders, continuing to record parts even as the mixing process is already several days underway. In theory, you record everything, then you mix it. But if you happen to be the band, the label, the production company, and studio owner all in one, then you have certain privileges. You can mess with the normal way of doing things. Sometimes they're done at Dennis's studio, sometimes at several of our other home studios. But we're enjoying ourselves too. 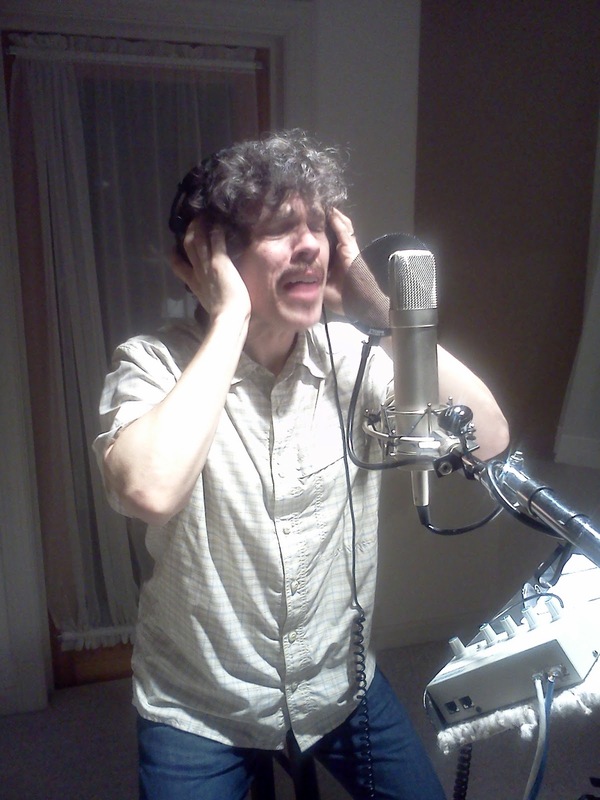 Here's a shot of Nathan joyfully singing his chorus harmony on "We're Still Rockin'." 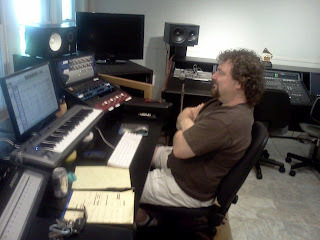 And here's a shot of our resident audio whiz Gary Dales sitting at the mixing board (bored? ), doing his magic. We were all gathered at the studio on a day Gary had been mixing "In '63," and we were so impressed with how it sounded that we broke into spontaneous applause. Having him on our team brings an incalculable advantage to what we do. We've been going over fine details of our album cover, and finally settled on a design we like, with all the credits in place. We've been working with graphic designer Brian Cox, who also worked on our previous CD "Fab Fan Memories." Oh, yes, as we've listened to our songs and wondered how to make them more beautiful, we couldn't resist one more idea, adding a gospel choir to David's song "If We Simply Love." Nathan contacted some singers from the church where he works, and found three who were available. Dennis, David and Nathan recorded them, while I left town for a family reunion. They sang together as a group, rather than separately as individuals. Our general approach is to record individual voices, to allow maximum control in the mixing process, but the advantage of recording a group, besides being faster - assuming the group sings well together - is that it captures the group sound, which brings a quality that can't be reproduced artificially. Three people singing harmony create a sound that is greater than the sum of its parts. Having three voices singing the notes on separate tracks is not the same experience as recording the three voices together on one track. There was one part where David joined the choir, for a bit of four part harmony. Naturally we want to credit Steve, Erin and Britney on the CD cover, but that involves going back to the cover designer, and to DiscMakers, and apologizing for adding one more request to our already swollen list of tasks to complete before the deadline. But we're getting used to last minute bursts of creativity. As David says, we've been swimming across the Atlantic Ocean, and now we're only a hundred yards from shore. This is no time to give up. We all feel great about this record, and really look forward to the rest of the world hearing it and seeing it too. The deadline for our album is still alive, which means we have only a few days to get our final musical parts recorded. The mixing begins next Tuesday. But the news that it must be done soon or not get done has sparked a burst of creativity. It could be that we fear that the opportunity may not come again. After all, making music is fun, but it costs money, and there's no guarantee that we'll even recover the costs of putting out this CD. But that doesn't stop us. We're using the studio for every advantage it can possibly yield, and that includes overdubbing percussion, strings, and horns. In fact, we've used the four home studios of each of the WannaBeatles to get this done. It's our way of honoring what the Beatles did. They became popular as a rock band who wrote their own songs, but within a few years developed into a studio band that used recording technology to present their songs in very imaginative and exotic sonic attire. Their growth enriched the entire palette of popular music. With the Beatles, it was partly a collaboration with their gifted producer, George Martin, who was very adept at writing, and conducting, complementary orchestral parts to enliven their songs, or helping them find unusual instruments to flavor the sound, like the piccolo trumpet on "Penny Lane" or the accordion and tambourine on "We Can Work It Out." One of the joys of being in the WannaBeatles is realizing that we have all that arranging talent built into the band. Each of us is capable of composing and writing out parts for horns or strings, so we have an abundance of ideas, and we have each other to check on whatever ideas get used. We decided to use a string quartet on two songs. Dennis's studio is large enough to accommodate four players. We had already worked with a string quartet last summer, when they joined us onstage at Crockett Park, for the two most famous examples of Beatles songs with string quartets, "Yesterday" and "Eleanor Rigby." We called Lauren Conklin, violinist, who called the other players. On our current CD, the songs that we're adding strings to are "If We Simply Love" and "In '63." David spent at least a day in the studio working on the parts for his song ("If We Simply Love,") and Nathan came up with a part for "In '63," which is a special tribute to Virginia Beach. We will be playing in Virginia Beach this summer, and we'll be performing with a local orchestra. Nathan has taken on most of the work of preparing the charts for them to play. It turns out that Virginia Beach is celebrating their 50th anniversary as a community. Dennis volunteered to write a special song for them, to be played with the orchestra. That means that it makes sense to put string parts on the song now, while we have the chance. For those of you who don't know, the string quartet is a classic format for composers. It consists of two violins, one viola and one cello, covering almost the entire range of the orchestra. Most of the great names, Beethoven among the most famous, have written music for this format. So the idea of four people making music together is a serendipitous historic theme that undergirds our efforts this way. David and Nathan are both capable arrangers, and both use their ability each week in their respective roles as worship musicians. If I could find a single word that would identify the style of each man's string writing, I would say "passionate" for David, and "stately" for Nathan. David's song is a soulful ballad, with a deep message. He has made it quite beautiful, even before strings were added. And now it has another layer of beauty. Nathan's parts for "In '63" give the song a very "uptown" elegance. It has the sophistication of those richly textured records produced in Philadelphia in the 70's - mostly Gamble and Huff productions, with groups like the Spinners and O'Jays. Dennis and I both find that Nathan's parts on "In '63" remind us of Elton John's "Philadelphia Freedom." Here are photos from the string session. First, David going over the charts. Four brave young musicians study their charts; Dennis's Grammy in foreground. Here they are working on their parts. The two violinists, Emily Scalici and Lauren Conklin. 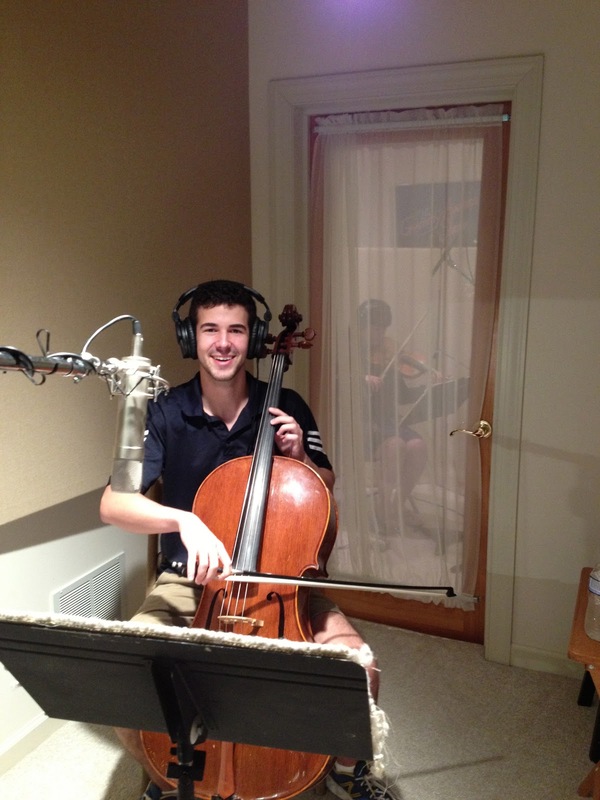 Here's the cellist, Ben Johnson, in another room. 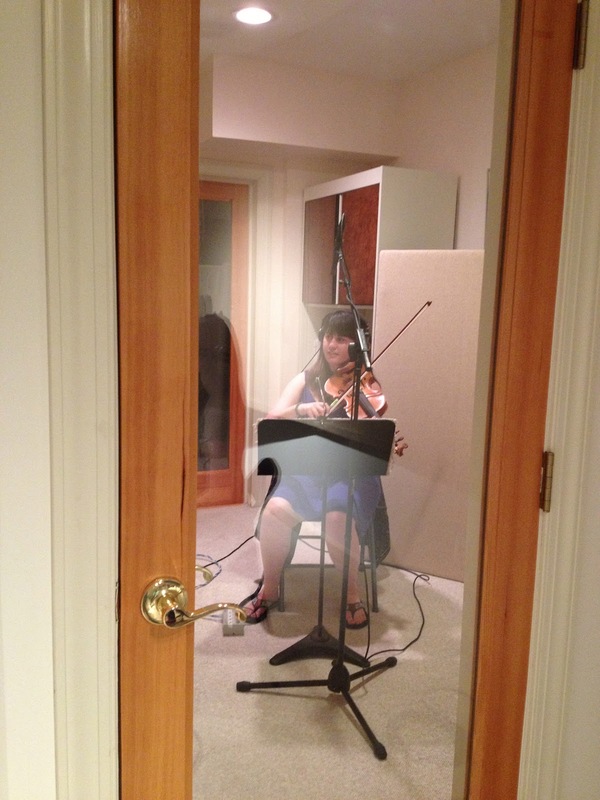 And the viola player, Megan Bilodaeu, through the glass in another room. Nathan's song "Bristol Lights" is a tribute to his hometown, Bristol, Vermont. The chorus includes a reference to a "band playing Sousa from the bandstand on the green." That line inspired Dennis to suggest a brass band, somewhat like the way a band interlude is used in the song "Leader of the Band," Dan Fogelberg's tribute to his father. Nathan was happy to write out a band arrangement, in a very authentic concert band style. He brought the trumpet parts to me, which we recorded here in my studio. He called up two other players he knows from church, to play trombone and tuba. Nathan recorded those parts at his studio, which is rarely used for anything besides his own scoring duties. So, once again, the WannaBeatles are breaking new ground, boldly daring to go where no Beatles band has gone before. Here are the shots from Nathan's sessions with Varney and Oscar. 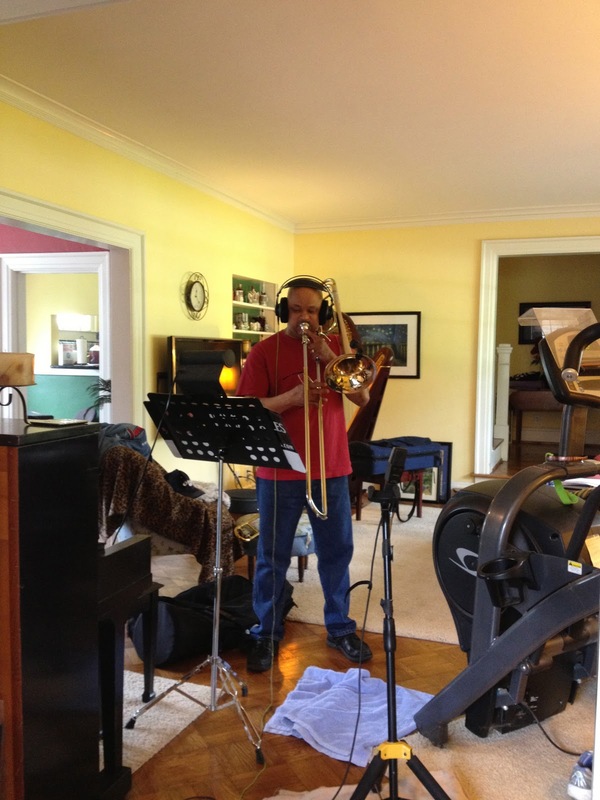 Varney Greene on trombone, in Nathan's living room, adding his part. Oscar Dismuke playing the tuba. Varney is a musician who plays at The Temple, the church where Nathan works as an organist and arranger. Oscar is a friend Nathan met through other connections. In addition to these, there are percussion overdubs by David's buddy Billy Ramirez. Billy brought his congas and other toys into Dennis's studio. The target song was "Let's Run Away," which has a Latin feel in the verses. Billy played a perfect part in one pass, so Dennis took the opportunity to add him to other songs. David tells me that the fun noises added to "License To Spy" take the song to a new level of insanity. I haven't heard it yet, but I will soon enough. Sorry there's no photo of Billy. We are very grateful for the musicians who have joined us in this great adventure. It's very gratifying to imagine, and then to realize, music that is bigger than just one, or two or even four people can make on their own. We're happy to have all their names included on the credits of our album cover. We're glad to be making music in Music City. We're excited about this project. We hope you are too. It's still on schedule...stay tuned. Dennis is our reality check. We say we wanna make a CD, and we decide it should be ready by June 23, our Crockett Park Concert. Dennis checks with DiscMakers and sends us an email saying "do the math." They need the audio by May 27th. It will take a day or two to master the songs. It's now May 9. We have three songs completed. And nine more have been written and started, with lots of parts recorded. We've spent over two weeks just trying to write one. The last two blogs have reported on the progress of "We're Still Rockin.'" Today we were at it again, trying out some new bass parts, based on Nathan's impression that the existing parts were anticlimactic, or in reverse order. David and I began working on new parts to fit with Nathan's idea. Dennis set up the session, where David could play bass and I played guitar, then Dennis went to the office - the room next door, where he answers phone calls, negotiates with agents and managers, and sends out promotional emails. He calls it "WannaBeatle Central." David was playing his Yamaha 5 string bass, and trying different ideas, always hearing new possibilities, having a hard time settling on a part that worked. Dennis heard our struggle, and came in from the office, offering to try out some ideas. Dennis is a good bass player, but doesn't like to admit it. He's busy playing guitar, and doing all the other things necessary to keep a band going, so he doesn't take the bass seriously. But he can't help knowing how to play, and coming up with great ideas. So it's a treat to turn him loose. Right away, he tried an octave slide that brought great energy to the beginning of the verse. We kept putting the pieces together, the right bass line for the chords, and the right guitar part. In many places, the bass part David had already played was fine, so we could use it instead. David used the low range of his Yamaha to play a low D on one chord, a note that's too low for Dennis's Fender Jazz Bass. But it was a cool sound, so we combined David's bass part with Dennis's. At one point, they both posed with their instruments, as the dueling basses. Nathan showed up later, and listened, and liked what we had done. David had an idea for a guitar fill between the two choruses. I played that, and then some more fills in the chorus. We found a style that fit somewhere between Chuck Berry and Larry Carlton. David wanted to try a new bass part for the instrumental section. We were already happy about the whistle solo he added. 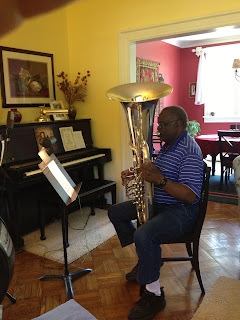 After trying a few ideas, he found himself playing a "tumbao," a Latin pattern where the bass hits the root note a beat before the expected downbeat. It creates an enticing undulation that really kicks that part of the song, as it rocks along under the high sweet sound of the whistle. It was exciting to hear the "world music" implications of so many different ideas from everywhere coming together in this one song. We looked at other songs. Nathan wanted to change the rhythm of a bass line during the middle of "In '63," so Dennis replayed that part. I still need to correct the guitar part there, to go with the new bass line; we didn't have time for that today. We also looked at "If We Simply Love," David's monumental anthem. This is one that has taken a tortuous path toward completion. According to WannaBeatle legend, David was so overwhelmed when Dennis asked him to explain what the song means that he fell to the floor in a fetal position. After weeks of rewrites and sending revisions back and forth via email, we finally reached a point where the work is mostly done. The way David says it his ugly baby has been made beautiful by all the plastic surgery we applied. We checked on other songs too, to see which ones were ready for David to record his drums. Last week's blog reported on David setting up his drums in Dennis's studio, and tomorrow is the day to record them. Dennis has hired Gary Dales, our mixing engineer and audio whiz, to oversee the process. We hope to get five or six songs done, maybe more. We're excited about this, and putting what we can into it. It's a challenge, but it's a treat, because we're doing what we dreamed about before we ever "grew up." We started this band because it was fun. And making an album of our own songs was a dream built in to the formation of the band. It's taken us five years to get to this point, and we're happy to be in the middle of it. We're sure that hearing the music will be more fun than reading about it. Be patient. The time is near. The deadline looms, and the music is alive. We also have to come up with a title and artwork, and lots of other details, before May 27. But we're on track, so you can look for a finished album from the WannaBeatles by June 23. Unless we stretch the deadline. Last week, we had spent several days bouncing ideas around for this song "We're Still Rockin.'" I wrote the blog about it, and got some interesting responses on our facebook page. One reader, David Walker, suggested we come up with a "Hard Day's Night" sort of mystery chord, to begin the song. That's a chord that fascinates Beatles fans. There are numerous youtube studies of its components, and theories about its ambiguous tonal quality. We've done our time studying it ourselves. I thanked David for the creative suggestion, without thinking it would have any application to our song, which starts with a drum solo. But the creative process is full of surprises. We were working on guitar parts for the song yesterday, with me playing my Line 6 Variax through the POD HD 500, with David making suggestions, and getting excited when I landed upon this or that guitar sound. "We're Still Rockin'" is in the key of A, which opens up certain possibilities on guitar. In last week's blog, we talked about how, after listening to Mellencamp's "R.O.C.K. in the U.S.A." we got inspired to try a simple flailing rhythm part, which lets the A string ring. There's also an historic model in Peter Townsend, who plays a lot of Who songs in A, and loves the power of that sound, built over the ringing A string. The chorus is in a different key, but it concludes with an A chord, which rings as the drums pick up the groove. As a variation on that chord, I slid one note, on the D string, up to an A, letting it ring along with the low A, to reinforce the sustaining root note. That was my intention, but my right hand was sloppy, as I hit the B string, along the upper E, at the same time. David's ears perked up, and he smiled. "Yes!" he said. "That ninth on top!" My mistake became his harmonic treat. David is a great explorer of guitar possibilities. He got that look on his face and said, "You're probably not gonna like this…." which is always a sign of a fresh idea brewing in his mind. He liked the sound of that chord (with the added ninth) so much that he wanted to use it as a new intro to the song, preceding the drum solo. I thought it was a pretty cool idea. Dennis was up for trying it. So we went to the intro, played that ringing chord, with the B added, and then used a different guitar sound to play a supportive chord on another track. We were adding notes, building a mystery - almost exactly like the way the opening chord functions in "Hard Day's Night." So we were arriving, with no intention of going there, at a place that someone had suggested in response to last week's blog, which had seemed totally unlikely at the time. Meanwhile, Nathan added some piano parts, finding an upper range pattern that resembles the piano from Roy Orbison's "Oh Pretty Woman." That classic record was recorded in Nashville, so we were reaching for influences close to home. David had started the week recommending that we buy a drum software program called Trigger, which would allow him to use "world class" drum sounds to replace his own drums after he recorded them. He then had a conversation with Gary Dales, our mix engineer, who convinced him instead to buy new heads for his drums, which would help improve the quality of the original sound. David has a home studio, and a drum kit set up, with microphones to record the whole kit. Typically, he listens to a song - minus the drums - on his headphones, then records his drum part, and sends the audio files to Dennis, where they're added to the song being mixed. That's been our way of operating, which saves the time and trouble of bringing the drums to Dennis's house, setting them up, recording them, taking them back, etc. Dennis has a separate room for recording drums, along with a practice set in the main room where we rehearse. It's the drum kit that Ryan learned "Come Together" when he was ten, which is featured in an earlier blog and video. It's been very useful to us, since David can come to rehearsals without bringing his drums. But now we're in a new era of working together on our own album, and we want the maximum opportunity for group interaction and group effort. Yesterday David stopped at Fork's to get new heads on his way to Dennis's, then took his time setting up his nice Yamaha kit, tweaking the heads, using WD-40 to remove squeaks, tuning each drum. He spent hours on it, and came out saying his kick drum had never sounded so good. Now the plan is to get a batch of songs ready for David to play drums on. We have "Now We're Rockin'," the high energy song David's already played on, but which will have a new track, featuring a new surprising guitar chord at the beginning - unless we change our minds. We have "If We Knew Then," a mid-tempo song that came from a set of lyrics Dennis wrote five years ago, during the early WannaBeatles period. We have "If We Simply Love," David's inspirational ballad. We have "Bristol Lights," Nathan's song about his home town in Vermont. We have "In '63," a rocking reminiscence that Dennis has assembled especially for a gig this summer we're playing in Virginia Beach, which is celebrating its 50th anniversary this year. We may have a few others. But time is growing short. We have a deadline, and we need to get the tracks recorded so that we can mix the songs and get the record finished in time to release it before our Crockett Park show on June 23. This process is really the part of our adventure we've been dreaming about for years - being in the studio, creating music together, and knowing that it will sound good and make people happy. Maybe that sounds overly optimistic. We're not four lads from Liverpool with nothing else to do - we've all got wives, children, responsibilities. But we're aware of how their creative accomplishments inspired so many others to follow that dream, and we're glad to be this far into the practical reality of realizing it. We look forward to sharing the results with you in about six weeks. Let the music do the talking.